Always Wished for Sparkling White Teeth? Try Laser Teeth Whitening! The process of teeth whitening involves the removal of stains and discoloration from teeth, and improving their color through a bleaching process to make them appear whiter. Laser teeth whitening or power tooth whitening is a procedure which uses a laser to activate the tooth whitening gel. Studies indicate that laser teeth whitening has proved effective in more than 80% of patients. There’s a good reason why procedures like Beyond Polus laser teeth whitening are becoming one of the most requested dental cosmetic treatments. The results obtained are very noticeable and the teeth appear almost 5 to 6 shades lighter soon after treatment. Looking good is amongst the main goals for every individual and having whiter teeth is a major step towards achieving this goal. Whiter teeth are always associated with beauty and are therefore highly coveted. Unlike most at-home whitening systems, a major advantage of laser teeth whitening is that you don’t have to wait for weeks before seeing the results. Also, the procedure only lasts for an hour. Conventional teeth whitening treatments involve wearing custom fitted mouth trays that contain bleaching gel, for 30 minutes to a couple of hours, and sometimes overnight; for a period of 5 to14 days. Most teeth whitening kits for home use include carbamide peroxide as the base ingredient. This slow acting chemical needs to remain on the teeth for a long time before it starts oxidizing the stains and discoloration. In contrast, laser teeth whitening uses highly reactive hydrogen peroxide on the surface of the teeth and the laser is focused on the bleaching compound to hasten the oxidation process. The dentist will first do a scaling or polishing before the procedure. This will thoroughly clean the teeth and remove any surface tartar and stains. Next, the dentist will make a record of the color/shade of the teeth before the procedure to show the difference achieved after whitening. This is done using a tooth color shade chart or digital photo. Since the bleaching compound generally contains a high concentration of hydrogen peroxide, the dentist will place some form of protection around the gums. Even eye protection is provided to avoid any damage to the eyes. 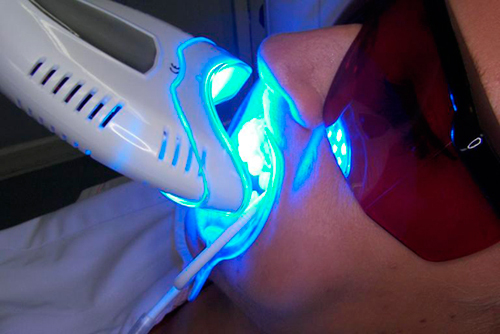 The whitening gel will then be applied on the teeth before activating the laser. The laser allows the crystals in the gel to penetrate the stains effectively and quickly. Lastly, the dentist will wash off the whitening gel and remove the gum protection before evaluating the final results. The results are dramatic and you will notice visible results instantly. Laser teeth whitening procedures are quick and provide instant results. For instance, the Beyond Polus teeth whitening system is designed to whiten teeth within just 3 ten minute sessions. The teeth may become very sensitive immediately after the procedure. Hence, it is advised to avoid very hot or cold drinks for some time. The dentists will offer fluoride treatment to reduce sensitivity, which usually stops after a few hours. In extreme cases the sensitivity could continue overnight. Treatments > Always Wished for Sparkling White Teeth? Try Laser Teeth Whitening!